Nikki Haley is fast becoming my hero. I love her accent and I love her heels. But more, I love the sound of her telling the United Nations what we’ve all whispered to each other. You are a bunch of biased, anti-Semites. No, those weren’t Haley’s exact words, but they’re pretty close. 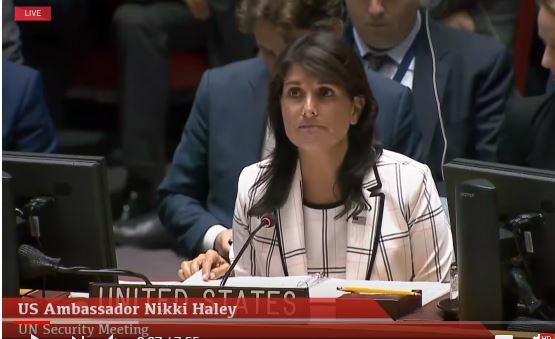 “Because this attack involves Israel,” says Haley, “the standard is different.” She goes on to explain that condemning Hamas for rocket attacks against Israel’s civilian population “should have been a no-brainer.” If you could have heard the laughter those simple words brought forth from so many Israelis, you’d be hard-pressed not to smile yourself. Some of us have waited decades to hear these simple concepts voiced loudly and clearly. What she says is simply the truth. But in hearing it in her voice, from her seat of authority, she is turning heads. Turning heads, and touching hearts. Listen to the whole broadcast. Did I mention she’s my hero?